Looking to buy or sell an apartment in Denia? On our website you will find numerous offers of flats for sale in Denia and surroundings. We have a great selection of floors, with the best performance, of greater or lesser seniority and located on the beach or town area so that you can easily find the floor in Dénia which best suits your needs and tastes. Apartment first line. The property hasf 2 bedrooms, a separate kitchen with a small glass-enclosed terrace, 1 bathroom with shower, a toilet and a large living room from which access to the terrace where you can spend moments enjoying these wonderful views to the Sea... The urbanization has a precious common gardens with communal pool and direct access to the sandy beach. 2nd floor apartment with two bedroom and without lift, 1 bathroom, open kitchen, livingdining room, terrace of 10 m² and private covered parking place. Complex with two swimming pools and gardens, 6 km away from the center of Denia, in firstline on the beach with direct access. First floor apartment distributed in 2 bedrooms, en suite bathroom, bathroom with shower, kitchen, living room and terrace with views to the common areas.Lift, garage, fitted wardrobes.Complex with swimming pool, garden, sauna, wifi, gym, common areas. Situated in the km 0.600 of Las Marinas and 200 m from the beach. Apartment like new in complex with spacious common areas, wellkept garden, swimming pool, children's playground and parking area.First floor with lift with separate kitchen with laundry area, dining room with access to the terrace, a bathroom with bath and two bedrooms with fitted wardrobes, from the master bedroom you can access the terrace with view to the common areas and to the mountain.The estate is in 2nd line of beach, but only 180 metres from the fine sandy beach.The price inclludes a parking place. 2 bedrooms ground floor apartment with a big sunny terrace for sale in Denia.Apartment with 2 bedrooms, 1 bathroom, American kitchen, laundry and a beautiful large sunny terrace of 38 m² with perfect orientation. Despite being a ground floor, it is elevated, so with a lot of privacy, adding the advantage of having direct access to the common areas and swimming pool. In a modern complex, with swimming pool, shower, garden and children play area, all just 150 m away from the sandy beach, in les Deveses.The apartment has got many extras such as awning, mosquito net and air conditioning (hot & cold) in the living room, electric towel rail and dresses fitted wardrobes. An underground garage is included in the price.A great apartment to enjoy a quiet summer with the family. 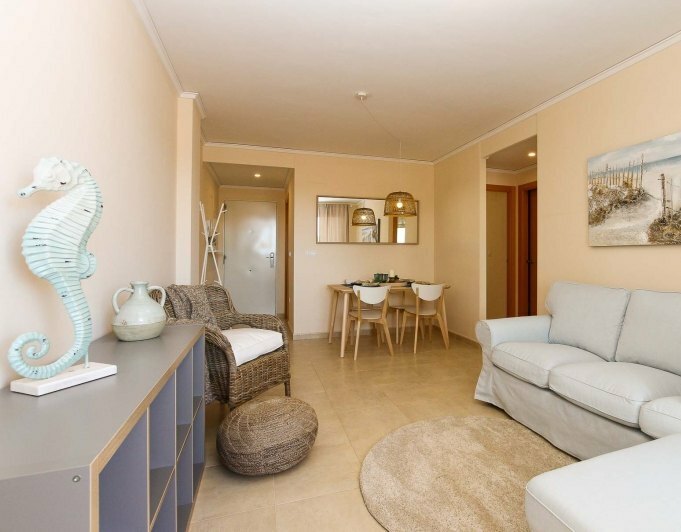 Beautiful apartment in the Denia area close to supermarkets, bars, restaurants and located just 200 m from a beautiful sandy beach and 9,5 km from Denia. Built on one level on the ground floor, in excellent condition and comprising of: 2 bedrooms, 1 bathroom en suite with shower and 1 bathroom with bathtub, 1 spacious livingdining room, 1 storage room, 1 open kitchen, 2 large terraces (one full south and the other covered, providing some shade in the hot summer months).Extra features include: fitted wardrobes, double glazed windows with shutters, air conditioning (h / c), electric water heater, alarm, safe, and private parking space. The community has a beautiful large garden with natural lawn and trees, two swimming pools (for adults and children) and outdoor shower. Community expenses are € 385 / quarter. The property is sold furnished and with electrical appliances. We highly recommend a visit! 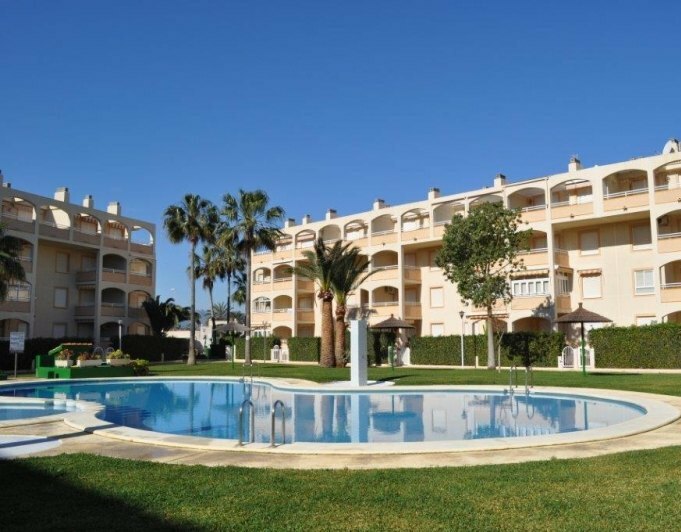 Ground floor apartment for sale at the beach of Denia.Halfnew complex with gardens, paddle tennis court and swimming pool. Ground floor with large private garden, 2 terraces, one to the North and the other one to the South, closed kitchen, living room, 2 bedrooms and 1 bathroom. Well orientated and perfect location due to its proximity to the sea. At only a few meters from one of the best beaches of Denia, with ample white sand and away from the crowds of summer.A wonderful place to enjoy life! Walking distance to the city center and the port. The sandy beach of Las Marinas is 200 meters away. Built in 2006 , the gated complex has an adult and children’s swimming pool surrounded by lawn, a gym, sauna, internet room, children’s playroom with a bouncy castle, free Wi-Fi. perfect for families. The apartment has a furnished kitchen. Underground parking. 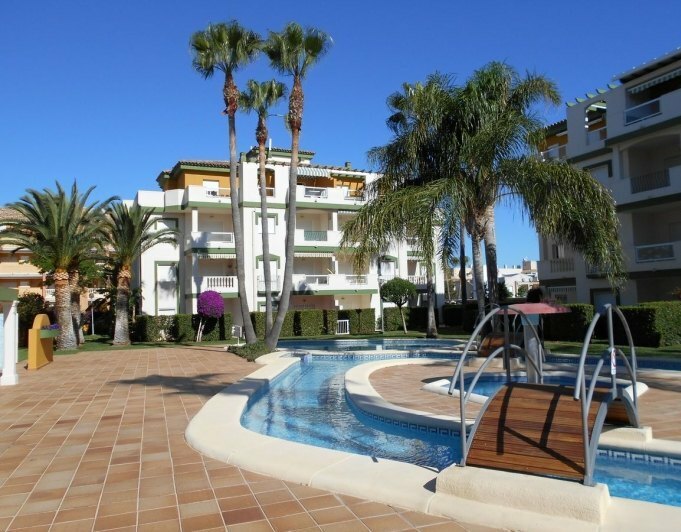 Apartment in Denia for sale, walking distance to the beach, supermarket and town center. Ground floor apartment with: 2 bedrooms, 1 bathroom, Kitchenette, dining room, 2 Terraces, Pre A / C system, Electric blinds and flyscreens, Community pool, garden and playground, 200m from the sand beach. Apartment in Denia for sale. In the town outskirts, walking distance to town center, restaurants, supermarkets and just 300 m from the sand beach. In front of a large park with fountains. Great area for long walks or biclycles. This second floor apartment, pays 60€ / month community, 225€ / tax. Great for all year living or holiday apartment and very good rental income. Apartment only 250 metres from the beach of Denia without crossing the road of Las Marinas. Located in a fantastic complexwith wide green spaces, gardens, community parking and large swimming pool... The apartment is on the second floor with elevator, has 2 double bedrooms, 2 bathrooms (one with bathtub and the other with shower), living/dining room, halfopen kitchen, large terrace, equipped with air conditioning cold and heat... It includes a storage room of 7,60 m². Charming groundfloor apartment with large terrace and direct access to the communal pool and garden area. proximately Around 75 m2 built, with 2 double bedrooms, 2 bathrooms, closed kitchen and livingdining room. fully Magnificent residential complex for your best holiday, located in 2nd line of beach 150 metres from the sandy beach, close to all services (bus, pharmacy, Consum supermarket, bars and restaurants) and 5 km from the towncenter, covered parking space. 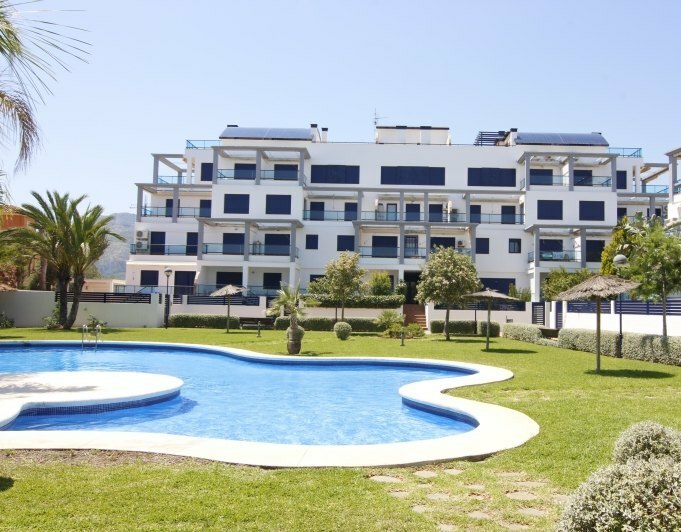 A fantastic opportunity to buy an apartment near to the beach in Denia! Apartment in Denia for sale in Santa Lucia, in the sunny low part of the Montgó mountain, a nice and quiet area of ​​Denia. A short walk from all amenities and the beautiful beaches and promenades of Denia. This townhouse consists in 2 bedrooms and a bathroom, a fireplace, air conditioning, gas heating with radiators in the bedrooms, great investment option and a great potential for subsequent rental always sunny, with mountain views and lots of light inside the property. Penthouse 5 min from Denia, in the area of the Sports Centre, orientation Southeast, in a complex with swimming pool, Livingdining room with large terrace, kitchen, two bedrooms and two bathrooms, one en suite. The building has a lift. Includes parking place and storage room in the basement. 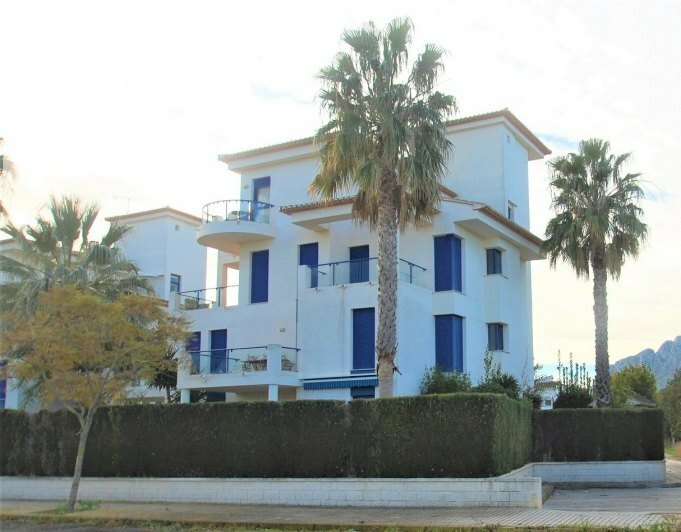 Ground floor apartment for sale in Denia. Do not miss this great opportunity to buy this ground floor in one of the best areas of Denia, 5 minutes walk from the beach and 10 from the center of the city. Thanks to its location, this property gives us the possibility of living in all year round or holidays. The property, is very well preserved, is composed of two bedrooms and two bathrooms, a kitchen with gallery and a large bright living room. The property has a large terrace with access to it from the lounge and master bedroom. The part covered terrace overlooks pool and the garden . The property features covered parking place, although you can forget about the car because thanks to its great location and close to everything, you can walk to everything you need.